This revised and expanded edition, which has 1:1 chapter-to-online module alignment, contains many learning aids that have been redesigned to help you reinforce the material in the course, focus on important concepts, and organize your study time for exams. Chapter Objectives are stated as questions at the beginning of each chapter. The objectives cover only the topics that are critical to passing the certification exam. The question format encourages you to think about finding the answers as you read through the chapter's content. Additional Topics of Interest is a new feature that indicates related information provided in the chapter that is not pertinent to pass the certification exam but would certainly be worthy to know on the job. Key Terms are now also listed at the beginning of each chapter in order of occurrence to alert you to the technical vocabulary that you need to understand as you work through that chapter. Key terms are then highlighted at first reference and defined at the end of the corresponding chapter. At the back of this book, an extensive Glossary collects all the key terms and their definitions. Check Your Understanding questions with an answer key help you keep track of your progress and aid studying for the assessments. 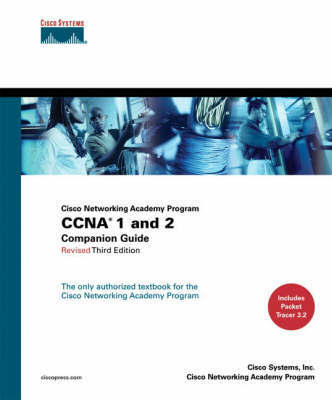 Cisco Networking Academy Program CCNA 1 and 2 Companion Guide, Revised Third Edition, is the Cisco approved textbook to use alongside version 3.1 of the Cisco Networking Academy Program CCNA 1 and CCNA 2 web-based courses. The topics covered provide you with the necessary knowledge to begin your preparation for the CCNA certification exam (640-801, or 640-821 and 640-811) and to enter the field of network administration. As in the courses, the CCNA 1 section covers networking basics, including the basics of Ethernet technologies, TCP/IP, network media, IP addressing, and routing. The CCNA 2 section covers routers and routing basics, including the basics of configuring routers, routing protocols, more TCP/IP concepts, access control lists, and networking troubleshooting skills. Use this Companion Guide as a portable desk reference to access the information for study and review at any time! In addition, new icons throughout this Companion Guide refer you to additional skill-building activities found on the companion CD-ROM or in the separate Lab Companion. This CD-ROM includes 25 new Interactive Media Activities, a customizable test engine with more than 250 practice questions, 10 PhotoZooms of Cisco equipment, 25 instructional Videos and Animations, and the Case Study Materials files you will need. PLUS Packet Tracer 3.2 is included, which is a Flash-based simulation environment to design, configure, and troubleshoot CCNA-level networks and animate packet flow. Also included is a special offer to save at ciscopress.com. This book is part of the Cisco Networking Academy Program Series from Cisco Press. The products in this series support and complement the Cisco Networking Academy Program.